Acorn Gallery, Ashe Arts Center, Ashe Custom Framing and Gallery, Backstreet Beads, Bohemia Gallery, Broomfields Gallery, Catch Light Gallery, Everything Has a Story, Fiber Artisans&rsquo; Studio, Florence Thomas Art School, French&rsquo;s Art Gallery, Originals Only Gallery, Ripples Gallery, RT Morgan Art Gallery, Shoemaker-Hadley Studio, The Artists&rsquo; Theatre, Tin Roof Gallery and Studio and The Vintage Locket. Join your friends and neighbors for Gallery Crawl and experience the Arts in West Jefferson. 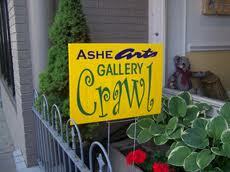 Gallery Crawl is free and is sponsored by the Ashe County Arts Council in cooperation with the West Jefferson Business Association and the West Jefferson TDA.&nbsp; Maps will be available at the Ashe Arts Center in West Jefferson and here at A1 Mountain Realty along with other participating galleries and shops. A1 Mountain Realty Real Estate office is located right in the center of the West Jefferson Arts District in beautiful downtown West Jefferson North Carolina.&nbsp; Stop by and check out Blue Ridge Mountain Real Estate and listings of North Carolina Land for sale in the mountains.&nbsp; We sell West Jefferson NC Real Estate and real estate across the High Country as well. You can check out all of listings from our website www.a1mountainrealty.com or do a MLS search for any listings in the High Country. Be sure to check out the webcam of the Downtown West Jefferson Arts District from our website, just click on the Downtown West Jefferson Webcam tab and take a look see at the goings on.